With kitchen scissors or sharp knife, cut loops of dried noodles into 3- to 5-inch-long pieces; place in 1-quart bowl. Pour boiling water over noodles; let soak 5 to 7 minutes or until flexible but still slightly firm. Drain in colander; rinse and set aside. Spray 12-inch skillet or wok with cooking spray; heat over medium-high heat. Add contents of meal starter bag, including sauce chips. Cover; cook 6 to 8 minutes, stirring frequently, until sauce chips are melted, sauce is bubbly, and vegetables are crisp-tender. Stir well. In medium bowl, mix cilantro, vinegar, lime juice and ground red pepper. 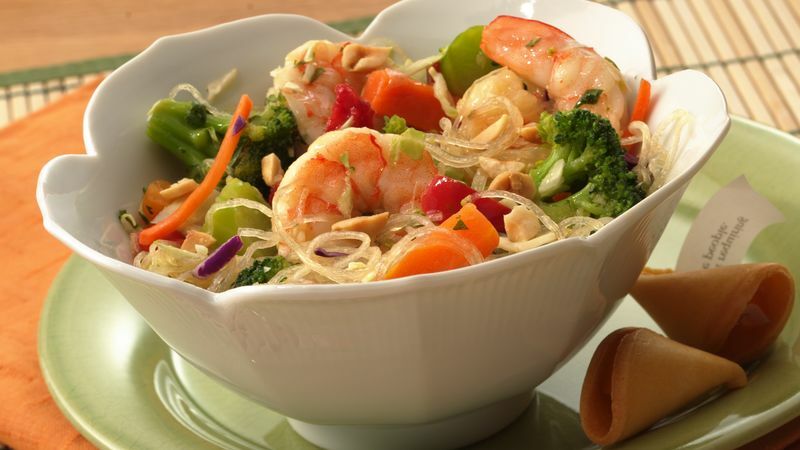 Add drained noodles, coleslaw mix and shrimp; toss to coat. Add cooked vegetables and sauce from skillet; toss. Top with peanuts.